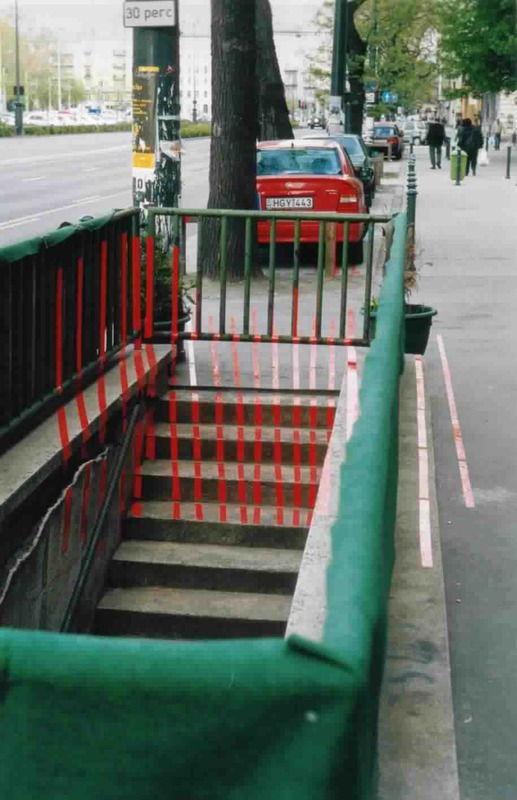 site specific (working title) is a non-commercial exhibition project that takes place in the public space or relates to other functionary places of Budapest. The concepts for this project will be realised with the direct experience of the town, of its situations and inhabitants. The participating artists are each interested in connecting art with every-day-life. With completely different means and under completely different art positions, one experimental musician and five artists make transformations of parts of the every-day-life. The aims of their transactions, too, are different. Involving real places, real time and what really happens, they move processes in the every-day-life of the people. The interventions shall give something to start one thinking / push the mind, and break up well worn patterns of action and perception. In this case, art means intervention. For some of the works goes: no art without the acteur (= the viewer) (Maki, Takano, hans w. koch, Veronika Witte, Barbara Hindahl), others make visible hidden structures with interventions (An Seebach) or hint to the private area of (not-) feeling and -thinking (Werner Degreif) - both are formative for the character of the public life and at the same time preconditions for the functioning public life that are often denied. 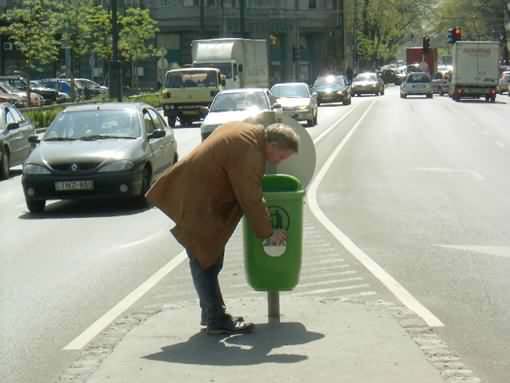 hans w. koch, Cologne installs musical objets trouvés, means well known melodies like birthday melodies, into rubbish cans. The work is interactive - with help of a photo sensor the song plays if someone throws something into the ashcan. The composer of new music from Cologne works about all kinds of blurredness and unsharpness. Maybe the element of accident, that is an essential part of all of his scores, maybe some electric or digital proceedings - their inherent vagueness and limits are researched about. His work subtly asks, with different focuses, for the relationship between the components of information and its content. His main focus is to make visible the already available that is in danger to vanish from the view because it is part of every-day-life. 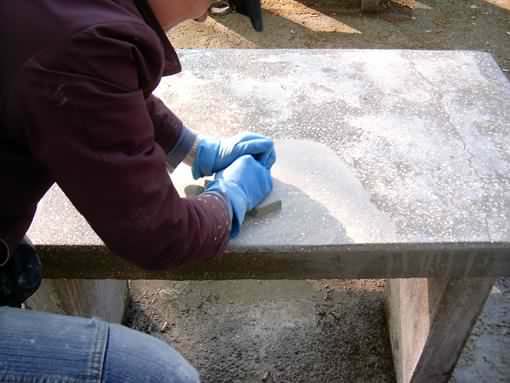 This work can be done best at concrete places and at defined dates. Nearly all the works of koch are site- and occasion-specific. 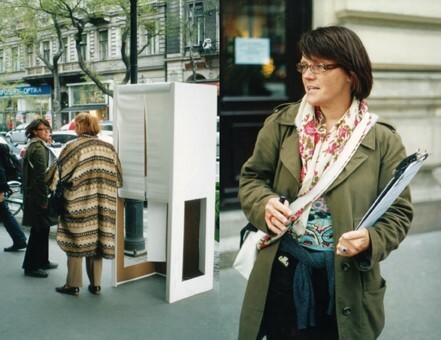 Between Tuesday, 26th and Thursday, 28th, Veronika Witte, Budapest, will stay at several sites of the city with a mobile election cabin. The pedestrians / people can fill in their personal answer to the questions on an interview paper. The results are shown in Liget Galleria. She realises objects, installations and interdisciplinary projects with other artists of other branches. Her starting point, in all of her various multidisciplinary works, is the research about the body and its representation in times of gene-technological reproducibility. 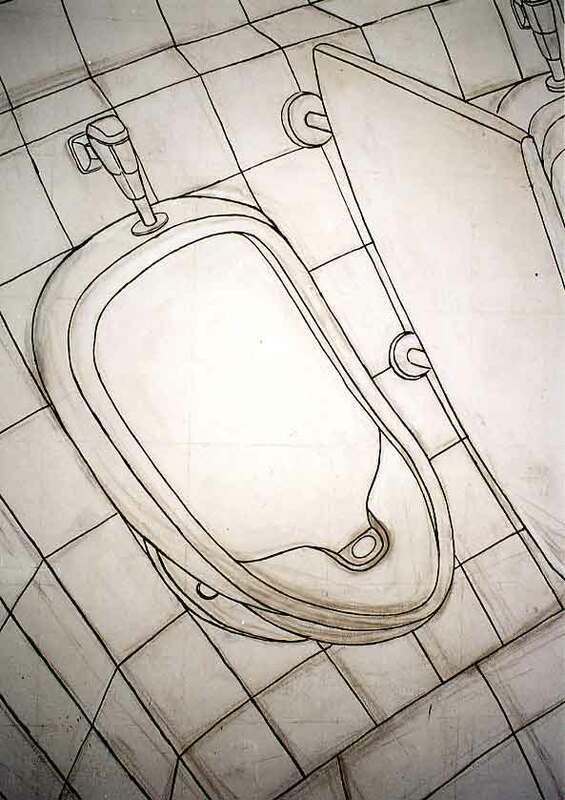 The interrogation of human beings, utopias, desires and situations is the basis for her installations and objects. From Monday, 25th to Thursday, 28th , An Seebach, Hildesheim / Budapest goes through the quarter with a sled with materials and tools and works on continues her approach of discovering and emphasizing (= stressing) every-day-structures that are nearly invisible. In Budapest she polishes little parts of ugly pieces of the pavement, lantern posts and forgotten walls. but to do everything without exertion and with joy. 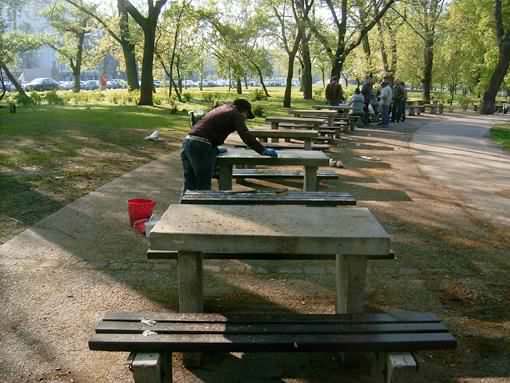 In his works in the public space, Werner Degreif / Mannheim uses to transport the private into the public space. 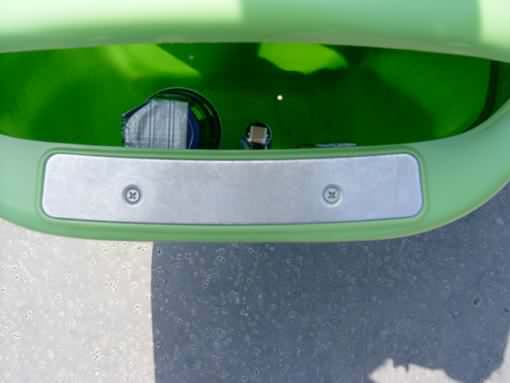 Pedestrians who are resting or lingering around at public places like traffic crossings waiting for green traffic light as well as when visiting a public restroom show an often unnoticed deeply private attitude. In Budapest, he shows, over dimensionally, line drawings of very private sites on poster advertising walls or public hoardings. 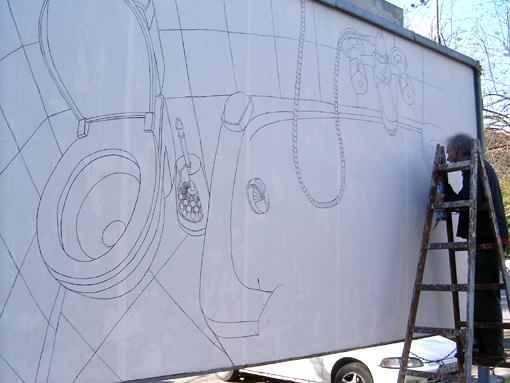 The drawings will show sanitary facilities. The concept artist Maki Takano / Yokohama makes an intervention in the gallery. She works with glass and mirrors. In her work, the reaction and the process of decision of the viewer is more important than the optical, aesthetic effect. Barbara Hindahl / Mannheim . Little marks on houses, emerge. 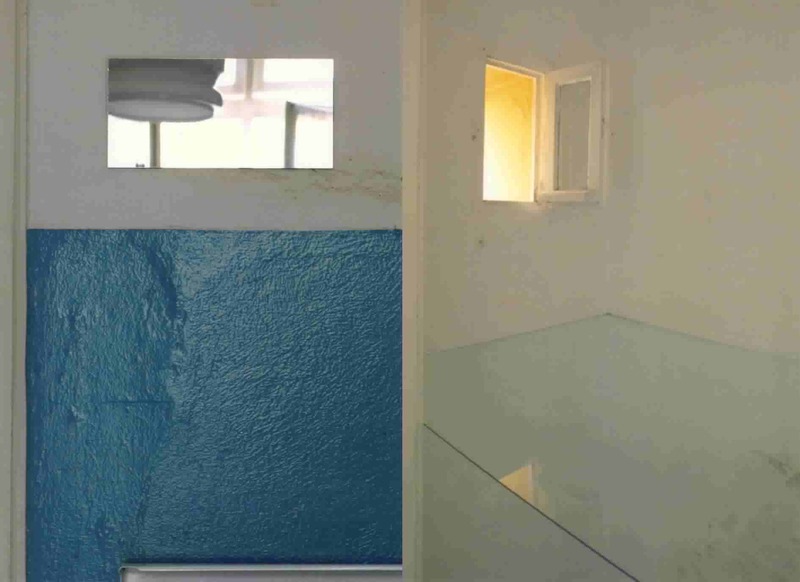 They sect and structure segments from the available place; inside the habited functionary place; unusual, non-functionary sites emerge. A clear, geometric or objective shape gets evident to the viewer if he looks from a defined place. Two-dimensional shape appears hovering over the three-dimensional real space. It is composed, like a puzzle, of the single shapes that are spread out in the site. As important as this illusionary view is the real place that is shaped between the marks. This space is always unusual and non-rectangular. 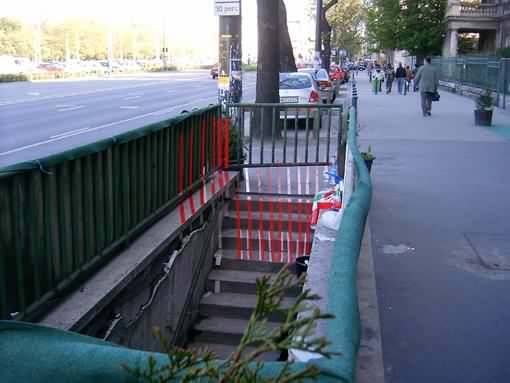 People move in this inhabited space and discover the illusion by accident.